graphics : Are We There Yet? Viewing storybooks online seems inordinately slow, even on a fast campus-wide network. For these reasons, most of my students reluctantly conclude that Panraven is not a reliable classroom tool, particularly for younger elementary students. The final product, while very compelling, is not worth the potential frustration of using the tool in a K-12 setting. That’s why I was thrilled to be directed by a colleague to Tabblo (pronounce it “tableau”). Like Panraven, Tabblo creates online storybooks. (It also creates comic books and posters up to 24″ x 36″, but that’s another blog entry.) Unlike Panraven, however, uploading images is very fast. In fact, in my side by side tests on the same computer using the same network, Tabblo uploaded images many times faster than Panraven. Tabblo never hesitated to upload properly, and dragging photos into a story within Tabblo worked perfectly each time I tried it. Viewing storybooks online is also much faster than with Panraven. Turning a page in Tabblo produces a pleasing”page curl” effect (which works forwards or backwards at both the top and bottom corners of a page) and there is no noticeable delay in loading the next page as there is with Panraven. On the other hand, Tabblo stories appear much smaller on a web page than do Panraven stories (which give you the option of enlarging the display if you want), making captions or small text difficult to read. If there is a way to enlarge Tabblo books, I have not found it yet. Creating layouts in Tabblo is a breeze, and, while you can choose from a variety of preset layouts, the author is afforded complete control over the placement of images and text boxes on any page. Pictures can be moved from one place to another on a page or dragged off the page and stored in a virtual lightbox for use later. Text boxes can be any size and can be resized easily. It’s simple to insert new pages or delete unwanted pages. And–these actions happen quickly, with no discernible delay in execution. Tabblo doesn’t win in every category, however. Panraven allows you to embed your stories into a blog, wiki, or other web page. I like this feature very much. Tabblo generates code that “simulates” embedding (that is, it places an image of the storybook cover in your blog), but that image is in reality just a link to the Tabblo web site. It would be wonderful if Tabblo allowed true embedding of projects into web pages. Below is a test story that I created with Tabblo. Notice that the captions are difficult to read. I cannot find a way to increase the text size in the captions. Even so, it looks like I am going to have to change my fall semester syllabus. We’re moving to Tabblo as an alternative to Panraven. Macintosh computers ship with an astonishing array of incredibly useful media software. The iLife suite (iMovie, iPhoto, iDVD, iTunes and iWeb, GarageBand) provides wonderful tools for creating and publishing media files across a variety of platforms. (Why a musician would buy any computer that did not ship with GarageBand is beyond me.) Intel-based laptops have been shipping with the incomparable Comic Life for quite some time. Even the viewer application Preview has excellent tools for cropping, resizing and adjusting photo a range of color parameters for photos. It strikes me a strange, then, that Macintosh–the platform that included the wonderful MacPaint and MacDraw applications from its first incarnation–does not ship with simple drawing and painting software. This omission is particularly problematic in K-12 education. Kids love to draw, and their illustrations often form essential elements in their stories. Schools with limited budgets must often overlook drawing and painting applications in order to acquire word processing and spreadsheet software. What’s a third grader to do? Seashore is a free painting program with a surprisingly strong array of tools. All the expected tools are there–paint brush (with lots of options), eraser, pencil, fill bucket, magic wand (for selecting colors) and marquee tools for selecting areas of your painting. 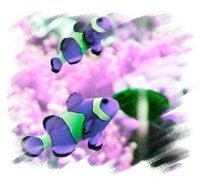 There’s also a smudge tool for blending colors and a PhotoShop-like clone (rubber stamp) tool. You can control the transparency of your paintings and even paint with a large variety of included textures. For more advanced artists, you can add layers and manage red, green, and blue color channels. Tools are easy to select and understand even for younger students. It’s a fine all-around painting program that should be on every K-12 Mac. If your graphics needs run more toward the photo processing side, consider Image Tricks from BeLight Software. Image Tricks uses the Mac’s built-in Quartz imaging tools to create an easy and fun to use photo editing environment. You can open or paste in photos or scanned images from any source (a handy link to iPhoto is available) and alter them to your heart’s content. Apply filters, change colors, rotate and distort images, crop and resize photos, and save in jpg, png, tif, gif, and even pdf formats. The Masks feature lets you apply borders and frames to your images. All filters can be easily tweaked to create beautiful and unusual effects. The tools are easily accessible and encourage experimentation and exploration. Mac users already have powerful photo editing tools in iPhoto and Preview. But Image Tricks has some new and exciting capabilities that expand the possibilities for working with photos. And–it’s tons of fun.